Grandma & Grandpa's Estate was valued over 20 million dollars, with 95% of it going to Charity. Please help us identify and place a valuation on Grandma's Teddy Bear. Now, about her bear.. Unfortunately, I can not find any identification tags on it. The bear is of obvious top quality, having extra soft golden brown fur, I believe glass eyes, soft leather sewn nose, paw and finger / toe pads, along with a buttocks pad... 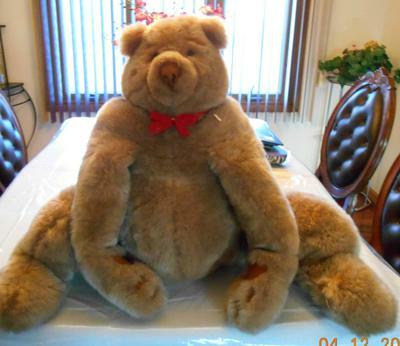 This bear is very large, in the sitting position, measuring 24" high from buttocks to top of head, and 15" across its back, side to side. This bear has a 40" girth (all the way around) just under its arms. The arms and legs are 18" long. 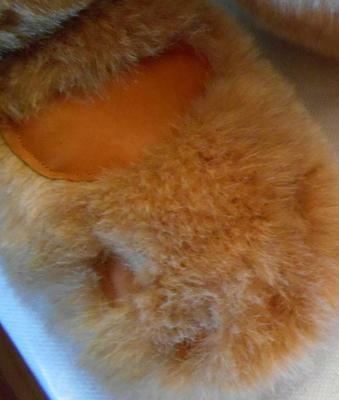 The Nose is sewn wrinkled piece of soft light brown leather, which is also sewn on patches for the hands and each individual finger, as well as the feet and each individual toe. 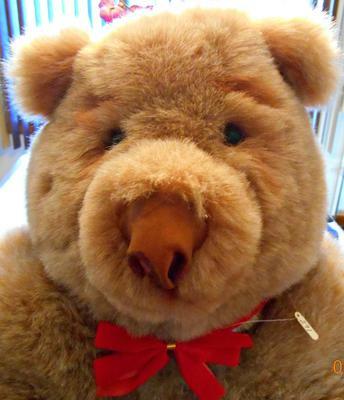 This bear has a bright red velvet / satin double bow neck tie, with a gold colored ribbon clasping the center. The fur in both Ears, Eyebrows, and around / below both eyes appears to be shaded with a touch of orange, lightening and highlighting those locations. The only marking found is a small white tag held around the neck on a gold thread with the hand written number 291 .